Since Halloween is almost upon us, I wanted to bust out some scary stories from my life to shock and amaze. Sadly, what I came up with will make me look like a bad person at worst, and at best be ridiculously funny. So after some thought I chose to lead off with the story that makes me look like a bad parent and my children look like demon spawn. At least you all will get some entertainment from this, but I am still traumatized so at least one of us has been adequately affected. My daughters are for the most part sweet children, but they are a tad high strung. I can actually hear my immediate relatives laughing right now from distant corners of the globe at this grievous understatement. Okay, to be fair they are very high strung, and I do not give them any caffeine at all because they already act like addicts going through withdrawal. Their sugar consumption is also strictly monitored because it doesn’t take much to send them into the atmosphere for hours. They are actually quite wonderful, and they just have so much nervous energy (I blame this on my husband who is exactly like them) so as long as they are kept busy and not overstimulated, they act like relatively normal children. So let’s introduce a far from normal scenario for my girls: a kids’ birthday party. We walk into a house we’ve never been to before, and there are a dozen weird children running around screaming. Something starts to slowly fray in my girls’ frontal lobes until they reach a point of no return when they are no longer able to make reasonable decisions or think anything through before trying to beat their peers senseless. After so much cake, ice cream, wrapping paper flying through the air, and adrenaline soaked girl drama, my kids just lose their cool and go completely ballistic. I am terrified of finding party invitations tucked into their school folders and try to dispose of them quickly before they remember that classmates had passed the invites around. I cringe when neighbors casually invite us to an impromptu party because I just know my kids will probably beat up their kids or kill their cat or set their house on fire, and then there is a good chance we won’t be friends anymore. I get the feeling that some of you readers (those who are not immediate family and close friends) don’t believe me, so I am going to present a list of evidence as to why I am so traumatized by my children’s behavior. Everything was fine until it was time to go. In my defense, I let my daughters stay through the entire party, so they had plenty of time to play. When I told them to put their shoes on they both went boneless and flopped around on the floor crying. I had to drag them up the stairs to the front door. This was at a house where I hardly knew the hosts or anyone else, so I was getting a lot of mixed looks of sympathy and judgment. Once I had the front door open my girls both grabbed onto the door frame and held on for dear life, bawling like stuck pigs. I had to pry them loose and drag them out to the car. The whole time they were screaming “No Mommy! No!” as if I were beating their butts. So embarrassing. Amazingly I allowed the girls to attend a second party the following weekend, thinking surely that last party was just a fluke and they would be on their best behavior. I was so wrong. This time we were at a recreation center and again I was with parents I didn’t know very well. These were the parents of kids I work with at the school, and most were the bratty ones –that would be parents and kids. I had a bad feeling when we walked in, and instinct told me to make up an excuse to leave early. But no, I stayed and made polite conversation with some of the cattiest mothers I have ever met while their children started instigating trouble with mine. And then I saw it coming: S-n-n-n-n-a-a-a-p! Both Annie and Alexis (my girls) decided that they had been pushed around enough and tiny fists started flying. I had to do the right thing, so I collected my screaming, red faced children, made apologies, scolded my girls and loaded them into the car. But secretly I was proud of them. I was sick of listening to their mothers but I couldn’t indulge in that behavior, no matter how much I wanted to slap their prissy faces. Surprisingly we were invited to yet another party, this time by a sweet mom who had witnessed the behavior at Party #1, and she either didn’t judge me or didn’t care because Annie is close friends with her daughter. I was really paranoid by this time, especially because the party was in an art center where I had done three months of teaching internship. I really did not want to make a bad impression, and as we were driving to the art center, I kept envisioning horror scenarios of paint splattering like blood onto the expensive art for sale in the gallery. I read my girls the riot act before we went inside, “Mommy used to work here, there is nice art on the walls, you absolutely have to be on your best behavior! If you do one thing, if you hit someone, if you scream, if you do anything mean, we will leave and you will lose all privileges for a week!” I shrilled at them before we got out of the car. Things went fine until Annie felt that she had been wronged by a toddler who took a cupcake topper that Annie had claimed. Annie was 7 years old at the time, but she had snapped once again and there was no rationalizing that a 2 year old should be spared her wrath. I intervened and discretely threatened the death penalty so Annie would calm down. We somehow made it out of the art center with no casualties, but it took some very strategic thinking and fast moving on my part. This party was the most traumatic party of all, to date. Some close friends invited me and the girls to their house for a small get together to celebrate their son’s first birthday. They went all out: delicious meal, homemade cake, a piñata full of candy in the back yard. My girls were so excited they could hardly contain their joy at the prospect of filling a little bag with goodies. There were not many children at the party, and very little chance for drama, so I relaxed a bit, had a tiny glass of wine, and chatted with other guests. I let my girls have a huge piece of the homemade cake as a courtesy to the hostess, since I could not eat gluten. I swiped a finger of frosting off the cake and wished I could ignore my diet for a day. I was starting to think that maybe those bad birthday parties were just anomalies, three bad coincidences in a row and nothing more. Then my friends announced that it was time to break open the piñata. Each child had a turn. Apparently I had not been paying enough attention to my own children because I didn’t hear the sound of Annie snapping. But everyone saw her take the two foot piñata bat when it was her turn and come after her little sister with a murderous glint in her eyes. She actually managed to chase Alexis a few feet, swinging the bat viciously, before another adult grabbed her. Oh, mortification, take me now! I wanted to die. We all cried in the car on the way home. My friend sent two enormous pieces of cake along for “when the girls are feeling better”. I ate them both for dinner that night with more wine and got very sick. I didn’t care. This party had confirmed my worst fears. My children absolutely cannot tolerate birthday parties, not even a little bit. We abstained from birthday parties for a long time after that. I was so traumatized that I couldn’t even consider the idea of sending my kids to a party. The potential repercussions were too horrifying to imagine. Then a neighbor up the street invited us to a casual little shindig and I thought, well maybe this will be a good opportunity to gauge their “progress”. Oh why do I do this to myself? My girls were horrible all day, screaming at each other, hitting each other, talking back to me, typical sisterly behavior. They actually lost their privilege to go to the party, and I was going to make them take a nap. Then miraculously, they stopped fighting, began to treat each other politely, picked up their toys, got dressed, and apologized to me. So I basically fell for it, but told myself that they had earned enough redemption to go to the party. The neighbor’s house was close enough to walk, so we strolled over, but the whole time I was reiterating my riot act. I told them it would only take one act of violence or disrespect and we would leave immediately. They made it exactly 30 minutes before Annie punched Alexis in the chest. And I kept my word; we walked home immediately, me striding ahead angrily and the girls crying and yelling and stomping behind. It was a tiny parade of rage for the whole neighborhood to watch. So I have come to three possible conclusions and they are all scary. Either 1) my children truly are demon spawn, 2) somehow I have failed as a disciplinarian, or 3) birthday parties are just too intense for my children, AND other parents have this same problem but just aren’t talking. So if anyone else has this problem, and more importantly some hilarious and scary stories of birthday party debacles, I would love to hear them! You can share by commenting at this site, or if you are my friend of Facebook, you can join the conversation there. Halloween parties are coming up next week, please pray for my family, and any families that may be directly impacted by my children! 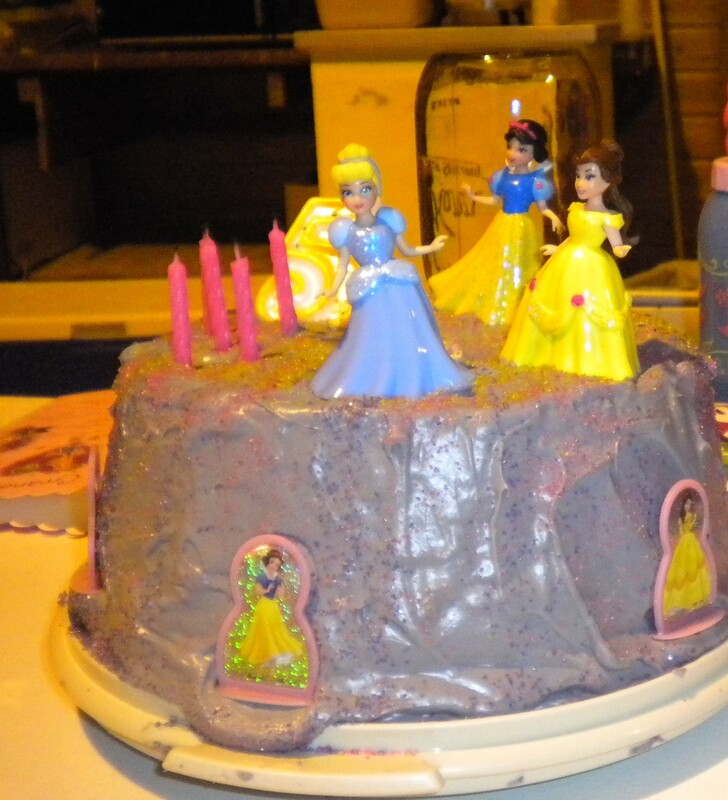 This entry was posted in Birthdays, Parenting and tagged Birthday, Children, Children's Behavior, Opinions, Parties on October 26, 2013 by Georgeann.